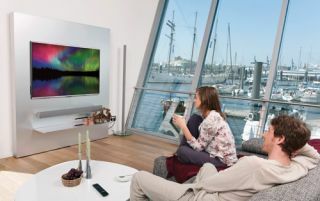 Sharp Quattron Pro TVs launch in the UK | What Hi-Fi? There are three new TVs in the Sharp UQ10 range: the 60in LC60UQ10KN, 70in LC70UQ10KN and 80in LC80UQ10KN. Sharp has offically launched its new Quattron Pro TVs in the UK, after showing off some of the range at the start of the year at CES. The new TVs, due on sale now, will cost £2100, £3200 and £6300 respectively, and join the rest of the Sharp 2014 TV line-up. Sharp claims the UQ10 TVs use '2.5 times the number of subpixels of Full HD panels', and are the 'only Full HD resolution TVs on the market that can display native 4K content in effectively UHD resolution through HDMI.' That said, any 4K content will be down-scaled to fit the TV's resolution. Sharp goes on to say that, even with lower-resolution video, the Quattron Pro TVs' smart upscaler will 'render the images up to 4K'. Remember, though, that we are still dealing with Full HD resolution screens. The UQ10 TVs use Sharp's familiar 'four-colour technology', which adds a yellow subpixel to the traditional RGB TV design (also seen on 2013 models) and is claimed to reproduce over a billion shades of colour. Elsewhere, the new Sharp TVs sport THX certification (the first Full HD LED TVs with THX display certification), Sharp's smart TV portal Aquos Net+, and support for the Sharp Aquos Remote Lite app. Slated for release in March, the Sharp UQ10 TVs should be on sale now. Look out for our reviews of the new sets coming soon.